Sunlight Supply-Titan Titan Controls Atlas 2 CO2 Controller / Monitor (702618) SEEDS ETC. 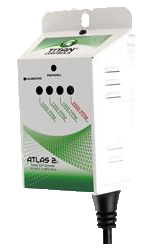 The Titan Controls® Atlas 2® CO2 preset CO2 controller monitors, maintains and displays the CO2 concentration in your growing environment. The CO2 readings are displayed by four green LED’s, with each LED indicating a minimum CO2 concentration. The Atlas 2® is equipped with a photocell, LED display and a one button calibration that calibrates the Atlas 2® to the approximate concentration of outside air..